How to Recover from The Runs | DH Automotive, Inc. How To Recover from The Runs - DH Automotive, Inc. This month I’d like to touch upon one of the common horrors that’s plagued many an automotive painter, I call it, quite literally: The Runs. The Runs have happened to all of us at some point. They seem to show up long after the paint booth has been vacated. 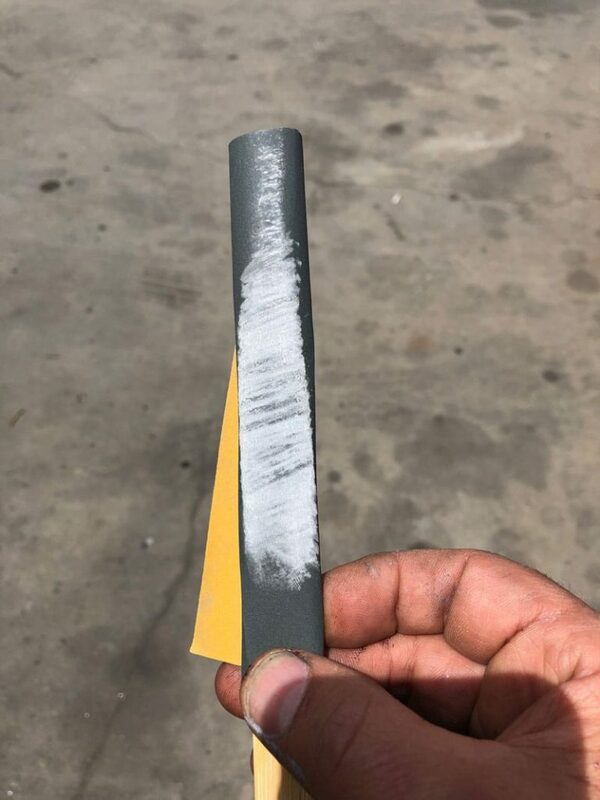 Typically they occur when the wrong reducer is used or the air pressure in the gun isn’t right, but the most common cause is keeping the spray gun in one spot for too long. A few years ago I had the privilege of restoring a 1967 Chevy Impala SS Convertible. 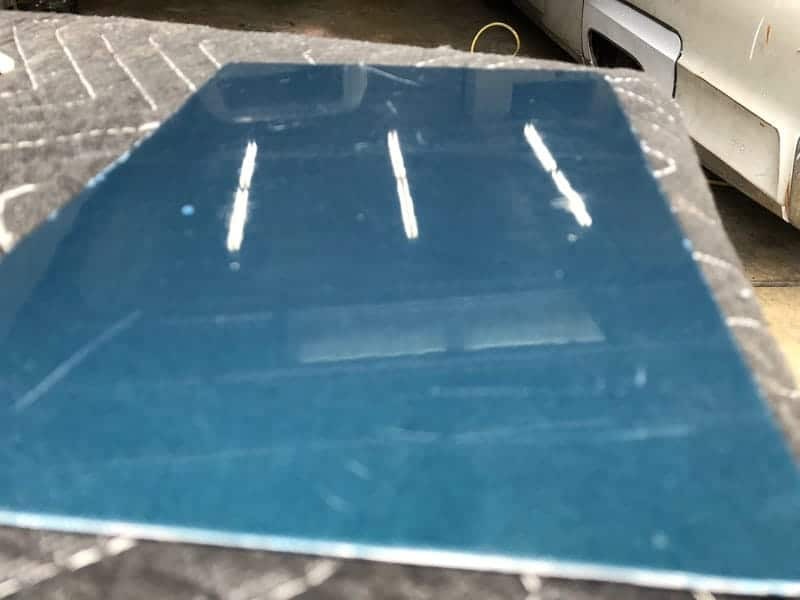 When the car arrived it was painted Bolero Red, General Motors Color Code R.
The client expressed interest in going back to the original color which was Tahoe Turquoise GM Color Code L.
As you can see above I created The Runs using the Tahoe Turquoise color on a patch panel by holding the gun for 10 seconds with an air pressure of 20 PSI. And though the result was entirely expected I experienced nothing less than an acute and unmistakable case of The Runs. The first step is the most difficult one of all: you have to wait and allow the clear coat to fully cure. Although wait time varies depending upon the weather, in general I’d say from a week to 10 days in the sun, longer if you live in an area that’s often overcast. If you don’t give it a decent amount of time the clear coat will tear like Jello once you begin to sand it down. Trust me you don’t want that. 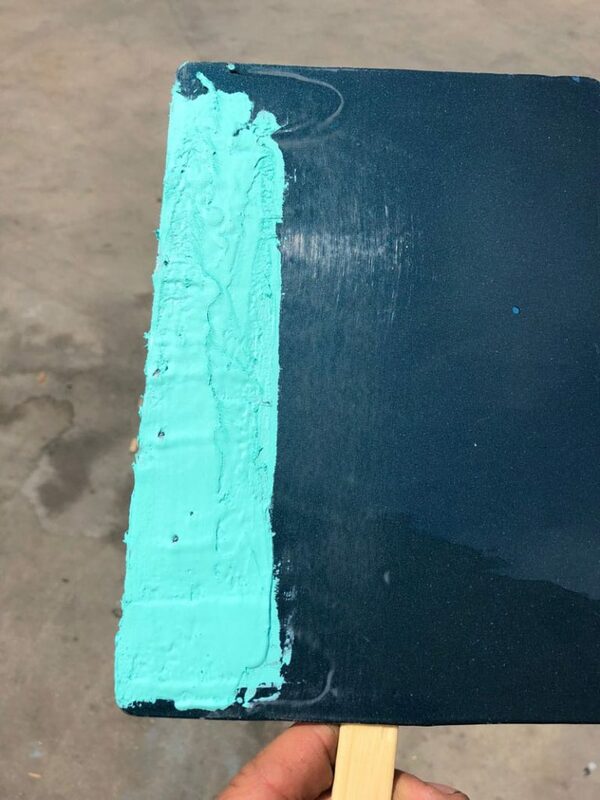 Also one other thing I need to mention: these tricks of the trade are designed for you to sand down the high spots without sanding through to the color or base coat and damaging paint. This is easier said than done of course, but with the right technique and a little luck you stand a chance of pulling it off. 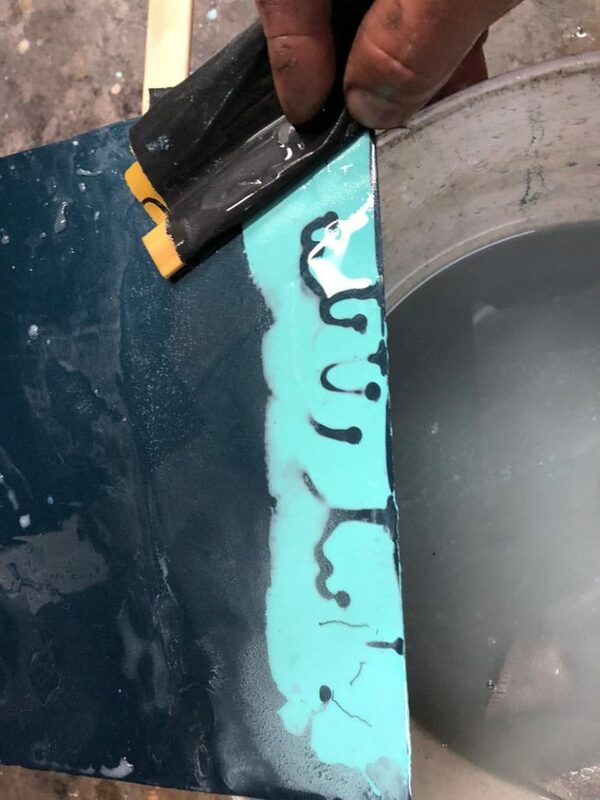 I’ve come up with a couple of reliable methods that will help you avoid sanding too far down to the paint leaving little to no clear when it comes time to polish. Before you attempt either method I strongly suggest that you get into a Zen state of mind so that you’re fully present as you begin the process. Although there’s no water involved you’ll be using Wet/Dry 1000 Grit sandpaper. You can use a small flat block or a paint stick. Use one that’s wide enough to see what you’re doing, and long enough to cut down to the size of the paper. Personally I like to use the whole stick which is easy enough to handle. Using the cross hatch pattern I mentioned in the Perfect Paint Job series you’ll want to begin hitting the high spots. The actual clear coat drops turning the paper and using a fresh section with few strokes. 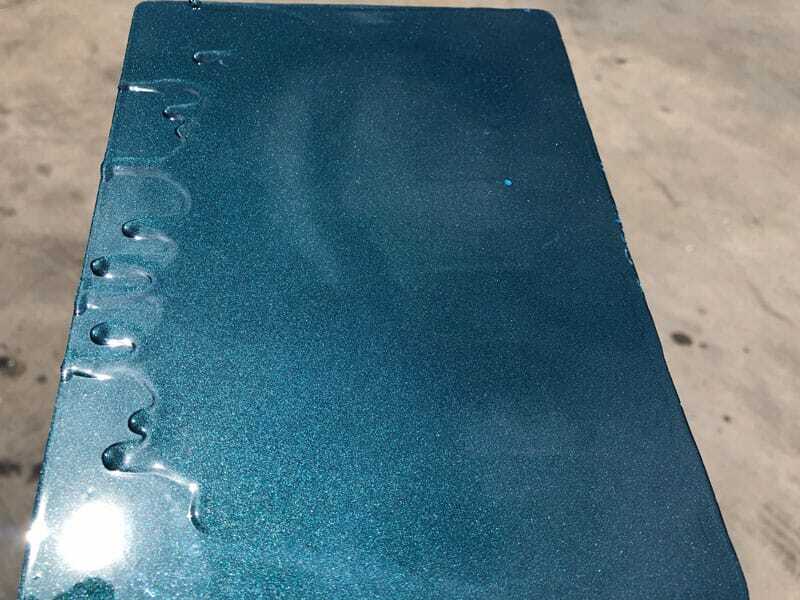 Like it or not you’ll go through a lot of paper as the clear coat builds up quickly. Fortunately you can minimize this if you slap it against your knee to clear away some of the excess. You can then go back to sanding before having to replace the paper. After about a dozen strokes flip the paper over and use a fresh section. At this point you’ll begin to see the pattern or waves in the clear. The idea is to get to a place where there is a smooth matted surface. Once you do so you’ll want to periodically wipe away the excess clear coat to see the full picture. This is very time consuming but it’s a surefire way to control the amount of layers you have to remove. This method takes less time and material but takes a little more skill. You want to first apply a generous amount of spot putty over the areas that have The Runs. Don’t worry about making it smooth, you just want to cover the area. Just channel your inner Julia Child spread it on like frosting and move on to the next section if you have multiple trouble spots. You want to allow ample time for the putty to dry. When in doubt locate the cure times on the back of the putty label. However don’t allow the putty to stay on the surface over night. This will cause a surface reaction which will stain your paint job. Once the putty is dry get yourself a bucket of water and some mild dish soap. The soap acts as a lubricant and cleaning agent which will allow you to cut through the clear coat faster. You’ll be using the same 1000 grit wet/dry paper. Before you begin allow the paper to soak in the bucket for about 10 minutes. Use the same crosshatch sanding pattern. In a few minutes you’ll notice a pattern will appear. It should look very much like a Rorschach test. The high spots will bleed through the putty alerting you of the depth of the run. Keep in mind you want stay away from the putty edges. 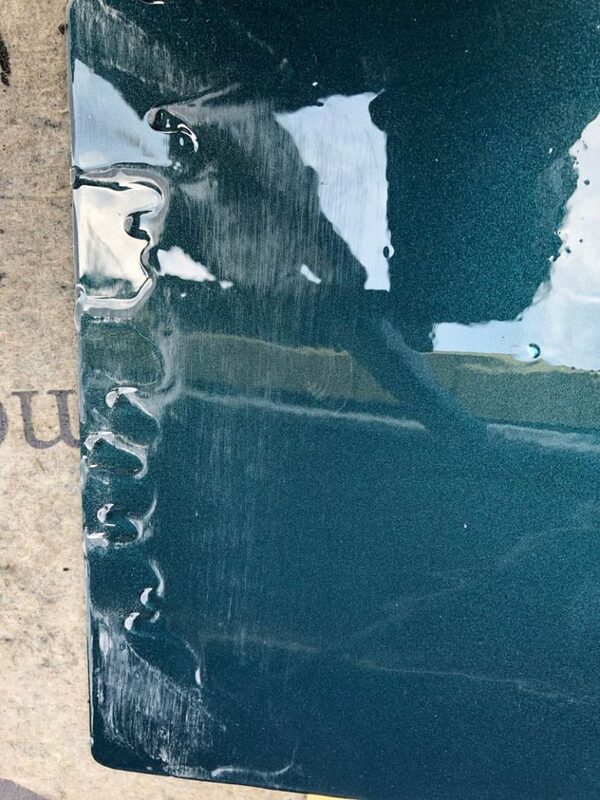 Only concentrate on the clear coat patterns and let the putty be your guide. Eventually you’ll have sanded off all the putty leaving a smooth flat surface ready to be polished. Remember to wipe frequently so you can get a clear picture. As with so many other areas of vintage auto restoration this will take time and practice but it’s entirely possible to recover from the runs provided you apply the above steps.